The first round of Transatlantic Trade and Investment Partnership (TTIP) negotiations kicked off today in Washington, D.C. with an opening plenary session emphasizing the importance of the negotiations and laying out plans for the round, which will end on Friday. The negotiating groups that met on Monday, July 8th discussed investment, government procurement, cross-border services, textiles, rules of origin, energy and raw materials and legal issues. The chief negotiators from the United States and European Union also met. Meeting on Tuesday, July 9th will be the negotiating groups discussing sanitary and phytosanitary measures, market access and industrial goods, government procurement, cross-border services, investment, and energy and raw materials. The negotiating groups on labor and environment also will hold a joint session. 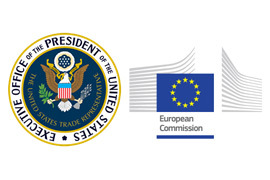 Press inquiries should be directed to Andrea Mead for the Office of the United States Trade Representative and Silvia Kofler for the European Union. More information about the negotiations on EU Trade Commissioner Karel De Gucht’s website .